With the sun in Aquarius (breakthrough and reform ) and the moon in Libra ( harmony and peace), today is Six of Swords Day. It is also the first day we’ve seen the sun in Oxford for some time. 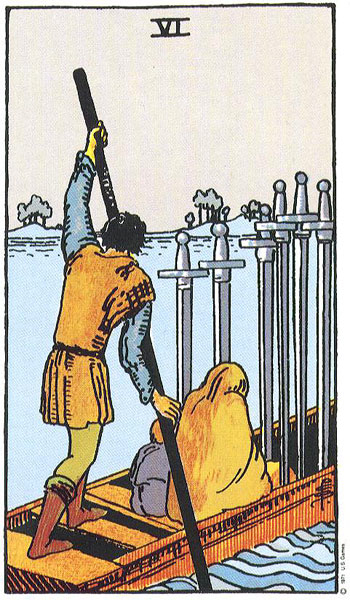 The Six of Swords is not a happy card. Yet it does suggest some sense of harmony resulting from coming to terms with yourself. Each of us has strengths and weaknesses. But in today’s world of constant competition, it is all to easy to identify with what you do wrong rather than what you do right. The serene state suggested by the Six of Swords does not spring from the tranquil heart as it might do with the Six of Cups, but rather from a tranquil mind. In his essay ‘Answer to Job’, Carl Jung suggests that physical reality is just one kind of reality. If someone holds a belief (regardless of whether it is possible or not of physical manifestation) and such belief holds meaning for that person, then that belief is as real as anything else. Scary – when you come to think about it. Even scarier if you’ve come to believe that you don’t measure up. I win – you lose. For better or worse, this is the world in which we live in today. On a Six of Swords Day, you can utilise your mind’s capacity for understanding to help come to terms with the negative beliefs you’ve piled on about yourself. On a Six of Swords Day, you can win back your dignity and self-respect. Next article Literary Criticism / passage from Winterson’s ‘The Passion’ – how did I do?